CM Pema Khandu distributed cheques to the local as compensation for land acquired by the Indian Army way back in 1960s. 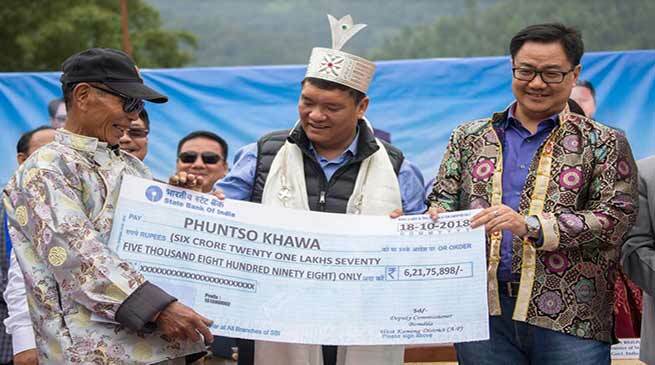 Arunachal Pradesh chief minister Pema Khandu distributed cheques to the local beneficiaries of Rs 24.56 crore as compensation for land acquired by the Indian Army way back in 1960s. Addressing a public meeting at Singchung, Khandu said the compensation was possible because of the blessings by PM Narendra Modi. He said the centre under BJP is always sympathetic towards Arunachal and said that for the nation and state to develop, Modi and BJP have to come back to power. Chief Minister also distributed cheque worth Rs 13.17 crore to Tukpen village council as Army land compensation, which was acquired in 1960s. Earlier Chief Minister Pema Khandu inaugurated the ADC office of Singchung constructed by PWD dept at the cost of Rs 1 crore. He appreciated the PWD department for executing a good quality work in construction of ADC office.